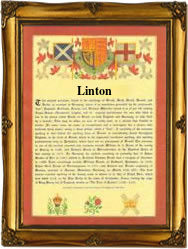 This long-established surname is of Anglo-Saxon origin, and is locational from any of the several places in England thus called, for example Linton in Cambridgeshire, Derbyshire, Herefordshire, Devon, Kent, Yorkshire and Northumberland, or from three places in Scotland called Linton: firstly a village in Peebleshire, now known as West Linton; secondly a parish in Roxburghshire; and thirdly East Linton, a village in Prestonkirk, East Lothian. The second element, in all cases, derives from the Olde English pre 7th Century "tun", a farm or settlement. The first element may be either the Olde English "lind", a Lime tree, or "lin", flax; hence, "flax farm or settlement", or "lime tree farm or settlement". Linton in Northumberland is named from the River Lyne (from "lei", to flaw), on which the village is situated. Locational surnames were developed when former inhabitants of a place moved to another area, usually to seek work, and were best identified by the name of their birthplace. One Richard de (of) Linton was recorded in the 1273 Hundred Rolls of London. Sir William Linton (1801 - 1880), an army surgeon, was inspector of hospitals in the Crimea, K.C.B. (1865). The first recorded spelling of the family name is shown to be that of Gamel de Lintun, charter witness, which was dated circa 1160, in the "Cartulary of the Priory of St. Andrews", Scotland, during the reign of King Malcolm 1V of Scotland, 1153 - 1165. Surnames became necessary when governments introduced personal taxation. In England this was known as Poll Tax. Throughout the centuries, surnames in every country have continued to "develop" often leading to astonishing variants of the original spelling.